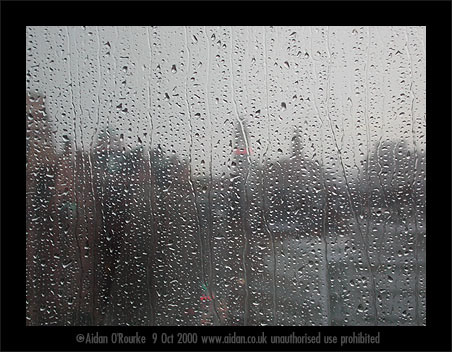 HEAVY RAIN poured down on central Manchester on Monday 9th of October 2000. I took this photograph at around 5.10pm from the 7th floor window of Gateway House, next to Piccadilly Station. 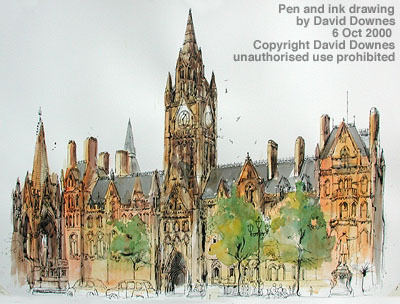 We are looking towards Manchester Town Hall - the main clock tower is silhouetted on the right - the smaller pyramid-shaped tower on the eastern facade is visible on the left. The tall chimney stacks are very striking, and not normally visible from street level. The taller block on the right is the Bank House, on Portland Street. Photographs like this are normally banished from promotional material about Manchester, but Andreas Feininger's smoky, steamy photographs of New York are famous, and Manchester, like New York, looks very striking in the rain, so what's the problem? 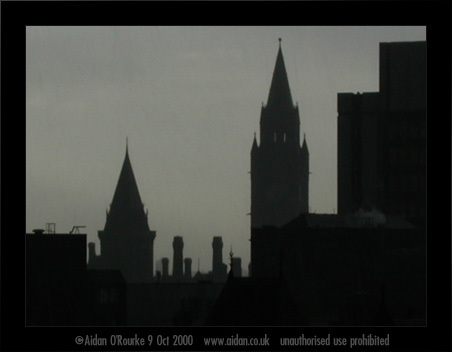 THESE PHOTOGRAPHS OF THE WHITWORTH ST DISTRICT of central Manchester were taken during heavy rain on Monday 9th of October 2000, looking from Gateway House, Piccadilly Station Approach. 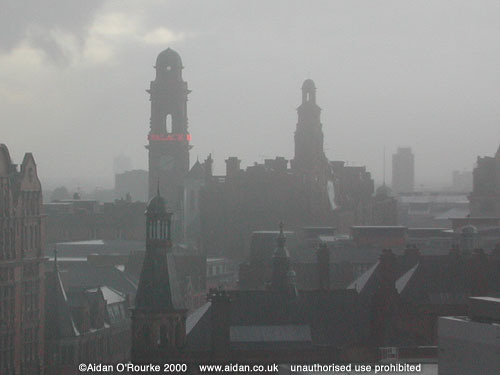 We are looking west towards the tower of the Palace Hotel (former Refuge Assurance Building), on Oxford Rd. To the right is the smaller tower of Lancaster House on the corner of Whitworth Street and Princess St. Over to the left is the main building of UMIST. In the lower part of the picture, we see Shena Simon College, which was formerly a secondary school. This part of Manchester is very much a product of the 1890's and 1900's, a time of great prosperity in Manchester following the opening of the Manchester Ship Canal in 1894. During weather conditions like these, we can imagine Manchester as it was around the turn of the 20th century, when Adolphe Valette painted street scenes using a similar colours to the ones in these photographs. WE ARE LOOKING ACROSS THE CHESHIRE PLAIN from Teggs Nose Country Park, above Macclesfield. It is Sunday 8th of October 2000, and the time is about 4.30pm. Today's changeable weather conditions are visible here - rain clouds hang in the sky in the foreground, but in the distance, the hills are shrouded in haze, lit up by the sun's rays. These are the Peckforton Hills, in south east Cheshire, about 30 miles (50km) away. Visible beyond them are the foothills of Wales, some 50 miles (80km) from here. 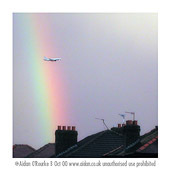 AN AIRCRAFT ON ITS FINAL APPROACH TO MANCHESTER AIRPORT flies through a rainbow - or so it seems. In fact, the plane is about three miles from here. 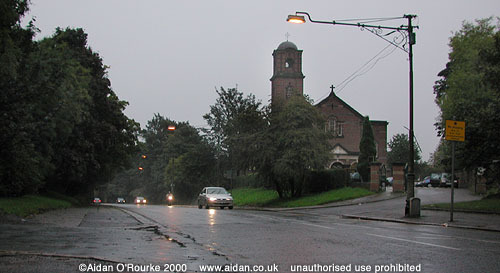 Our viewpoint is at the junction of School Lane and Kingway, Burnage, and the plane is flying over Stockport. As for the rainbow, it's difficult to say how far away it is, as it is an optical effect of sunlight reflecting in raindrops, but to our eyes, it appears to be a few hundred yards away. Like the perfect photo opportunity, it's always fleeting and often disappears before you can grab your camera. This time, fortunately, I managed to capture the moment. RAINBOW OVER KINGSWAY - This is what we saw on the afternoon of Sunday 8th of October - and a very impressive rainbow it is too, due to a number of factors: - thick high clouds producing rain that's both fine and heavy, plus intense late afternoon sunlight shining from just above the horizon. Even the fainter outer ring is visible - this only happens when conditions are optimal. I took this photograph from the car window, parked on the pavement on Kingsway, about 100 yards from the junction with School Lane. We are on the northbound side of Kingsway, looking east. 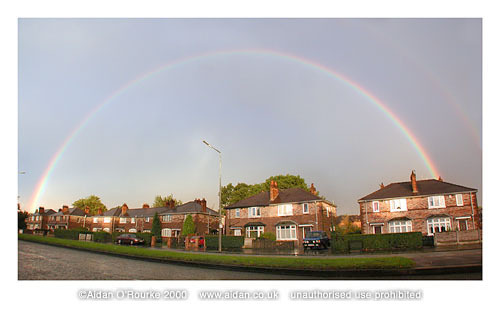 They say there's gold at the end of the rainbow, so there must be two lots of it, somewhere in Burnage, probably in the back gardens of those houses. If anyone finds it, please contact! 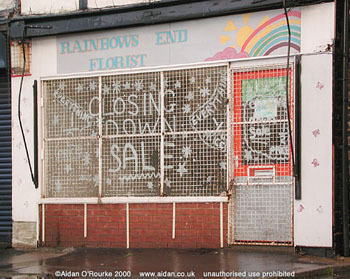 Whilst rainbow-chasing, we passed this shop on Burnage Lane. Sadly, the pot of gold appears to have eluded the owners as it has recently closed. 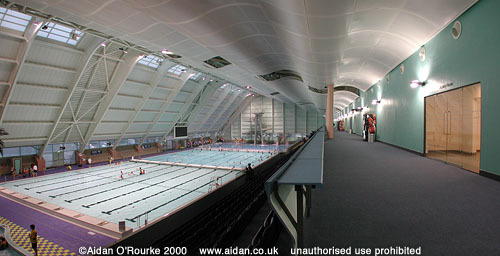 THE MANCHESTER AQUATICS CENTRE, also known as the Commonwealth Games Pool opened its doors to the public in late September 2000. It's a high-tech building with state of the art pools, a fitness centre, a health spa and other facilities. Opening hours are early morning till late at night. It's a welcome addition to Manchester's sports facilities but... (there had to be a but, didn't there!) there will be a price to pay: The swimming pool at the MMU Didsbury campus, used by many local residents, is set to close. Reason given: It's not needed now the Manchester Aquatics Centre has opened. A campaign is in progress to save it. Also: When I visited the centre late afternoon, the pool had been divided off, leaving only the central portion open to the public, and very full. You might as well save the bus fare and go to your smaller local pool - unless it's been closed. The exterior stonework was cleaned in the 1970's, though weather and air pollution have started to darken it again. 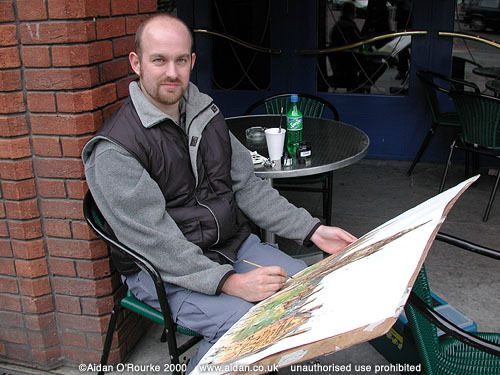 Here it is seen through the eyes of artist David Downes, who on 6 October 2000, I saw working at one of the outdoor tables of Via Vita restaurant, on Albert Square. 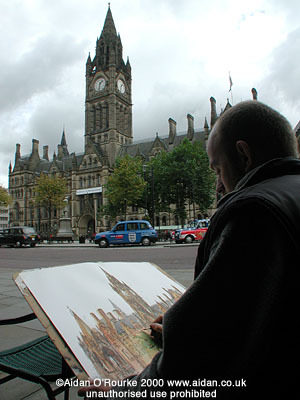 DAVID DOWNES is artist in residence for the BBC - He's originally from Suffolk but now lives in London I noticed him drawing the Town Hall on Friday 6 October 2000, and decided to feature him in Eyewitness in Manchester. So how does he like Manchester? "I'm very impressed with the centre of Manchester. The architecture is excellent and there's a great atmosphere. It feels more like a city than London - the height of the buildings gives it a European feel, the trams too. I'd definitely like to come here again." LIVERPOOL CITY CENTRE is seen here from the steps of the Walker Art Gallery. On the left is the legendary Liverpool Empire theatre, which is still in use. Next to it is the hotel which was converted after many years of disuse into student residences. Lime Street Station is behind it, and over to the right, we see the magnificent St George's Hall. Liverpool is 35 miles (50km) west of Manchester. There are regular train services, but the National Express is the cheapest way of getting there - only £4 return. QUEENS DRIVE LIVERPOOL is the location of the only remaining pre-war lamp standards anywhere in the north west and possibly the UK (please contact if there are any more you know of). This stretch of road passes under a railway bridge marked '1926' so these lights probably date from that year. The cables are still strung from lamp post to lamp post, rather than buried underground. These lamp standards may also have supported tram cables. With their ornate wrought ironwork and double support struts, they represent the design values of another age. 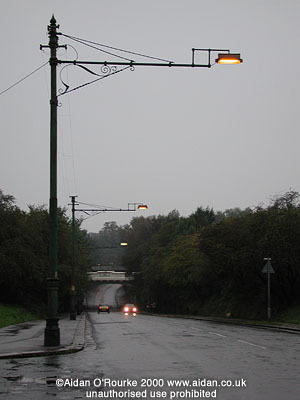 Street lamps of this type were seen all over Liverpool right up till the 1950's when they were replaced with a more modern design. Well done Liverpool for protecting its urban design heritage. 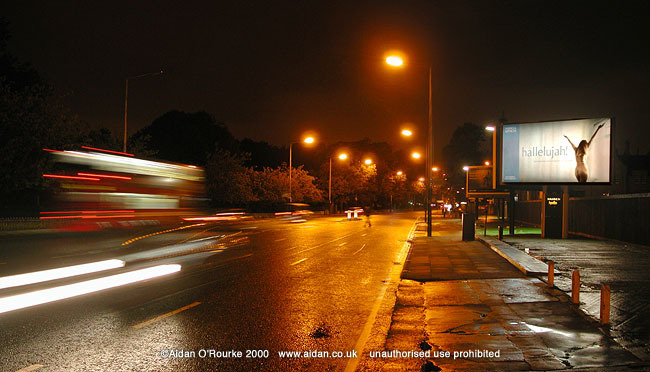 WILMSLOW ROAD BY NIGHT - here illuminated by street lights, pasing traffic, and a backlit advert. The reflections on the wet road surface caught my eye, as well as Marks and Spencers controversial advert - the campaign came ended late September 2000. Whitworth Park is across the road to the left. Further up the road to the left, behind the trees, is the Whitworth Art Gallery, and opposite it, Manchester Royal Infirmary. On the empty plot to the right, a new shopping centre is to be built, so this scene will change soon - though luckily I've caught it for posterity in Eyewitness in Manchester. THE AMBASSADOR CINEMA IS TO BE SAVED, it was announced in early October 2000. A campaign by local residents, backed by Salford-born actor Christopher Eccleston led to the building being listed, and so it cannot be demolished.